For at least 500 years a lavatory was a room for washing, a basin, a bath, or a laundry. 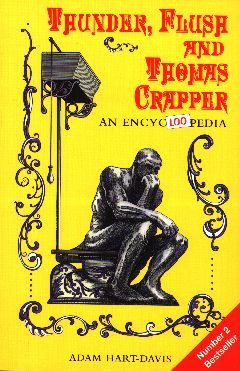 After about 1850 (OED) lavatory came to mean also a receptacle into which a person can urinate or defacate. In the sanitaryware business today, a lavatory is a wash-basin; a bowl for excretion is a closet; see euphemisms. Women are apparently irritated by men leaving the seat up; so some bright spark in the USA has invented a loo that lights up in the dark. When the infrared sensor detects a person approaching, the light glows green if the seat is down and red if it is up. The locks on lavatory doors---at least the kind with a rack and pinion that moved a label to say ENGAGED when the lavatory was occupied---were invented by Arthur Ashwell. He took out a patent in 1882 (No 781), and another, for an improved version, in 1885 (No 6928). The improved mechanism was better designed and easier to fit. Furthermore it not only incorporated a hidden spring "which renders the action of the bolt smooth and noiseless", but also allowed for notches to be included for locks on board sea-going vessels to "remove the liability of the bolt to be shot or withdrawn by the rolling of the vessel at sea". In 1995, according to the Evening Standard, Greater London boasted 3,226,909 household lavatories, but 13,816 households had no inside toilet.